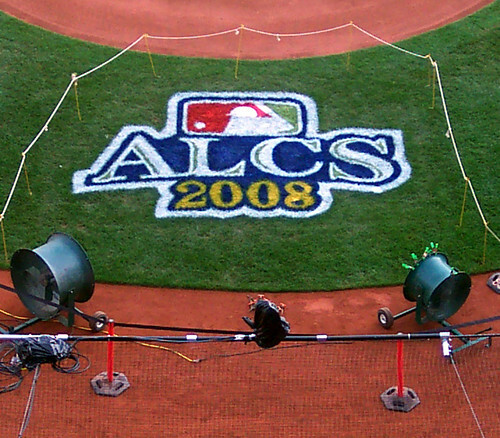 ALCS 2008 logo – Fenway Park, originally uploaded by misconmike. Two teams enter, one team leaves. Baseball is rarely that simple, but the series of events that led us here is as rare as they come. Questions abound, as usual. There are lots of questions to be asked about Lester, for example, beginning with the sudden loss of velocity in the second inning of his last start. But I feel good about him, and I feel good about our team, because I believe. There is a difference, a crucial one, between believing and knowing, but I believe nonetheless. And after the past two games, don’t you too? Two teams enter, one team leaves. Let’s be that team. Talk to you tomorrow.